New Hampshire Animal Rights league, Inc. - Vegan Presentations - New Hampshire Animal Rights league, Inc.
Board member Emily Murphy gives our vegan presentations and has done them at UNH and Dartmouth College. 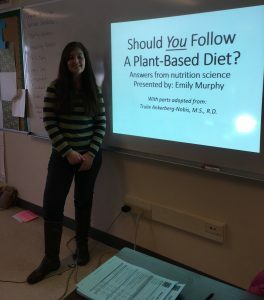 Emily just presented at the Northeast Organic Farmers Association Winter Conference on March 18 and will be presenting at the 2018 NH Vegfest in Manchester, NH, April 14. We are always looking for other events to present at. Please let us know of any other places that you know of where Emily could present. Thanks. Emily’s presentation is great, btw!